Posted on December 27, 2010 by Jill B. It may look like a glorified vending machine but its digital offerings should perk your curiosity. 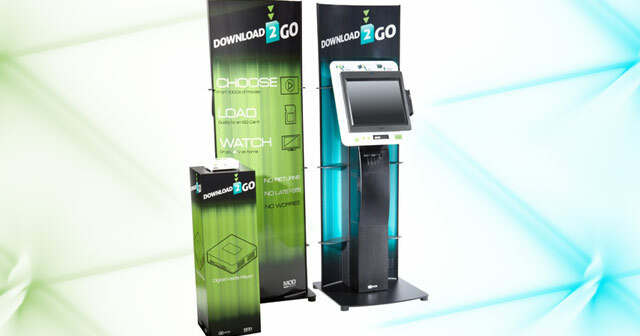 Courtesy of MOD Systems, meet the Download2Go kiosks. Think of them as miniature music and movie stores, no bigger than the width of a grocery aisle. Their main function is to allow you to download movies or songs (DRM-free!) straight to your USB flash drive, SD card or MP3 player. Without DRM (Digital Rights Management) there are none of the usual guidelines or protection practices in place that limit how and where you can use the entertainment that you purchase. The USB kiosks were beta tested in a handful of Blockbuster and Hollywood Video stores with some success. As a result, movie versions of the machines popped up in 30 InMotion Entertainment stores this past summer. Now, ten Quick Chek stores in New Jersey and New York are testing the waters for the music kiosks. The USB movie downloads can be chosen from the kiosk’s vast collection of thousands of movies that can be easily browsed by category through a simple, intuitive search tool. You have a choice of either buying or renting titles. Like Flix on Stix, you don’t have to worry about returns or late fees. Once you start watching your movie, you have 48 hours until the content will naturally expire on your flash drive or SD card. For the USB music downloads, you can download specific songs or entire albums. These MP3 files will play on computers, media players and can easily be transferred to other USB devices. Downloads will take just 30 seconds to two minutes as opposed to hours experienced with some finicky home bandwidths. An added bonus to this minimum wait time is that the MOD Systems download kiosks allow you to continue watching trailers and listening to music previews while you wait. Secure, on-site servers holding the most popular movie titles are responsible for the most speedy download times. For more obscure titles and tracks, a remote server is accessed, which may take a little longer. While the flash drive entertainment kiosks are limited in availability, their initial success bodes well for the chance that you’ll see one turn up at a nearby corner. The concept is certainly appealing and it’s on the minds of multiple entrepreneurs (like Flix on Stix). Based on these factors, it just might have a winning shot at becoming a comprehensive entertainment download option. Would you rent from a Download2Go kiosk? Comment below! This entry was posted in Articles, Flash Drive, MOD Systems, Movies on USB Flash Drive, USB Flash Drives, USB Future, USB Technology and tagged Download2Go kiosks, Flix On Stix, MOD Systems, MOD Systems Download2Go, MOD Systems USB Kiosk, USB Flash Drive Movie Kiosk, USB Flash Drive Movie Music Kiosk MOD Systems Download2Go, USB Flash Drive Music Kiosk, USB Kiosks. Bookmark the permalink.